While the Republican Governors Association (RGA) attack ads may have done a lot of damage to Cahill, they haven’t helped Baker very much. The most recent Rasmussen poll suggests the main beneficiary of the support Cahill lost has been Patrick. Baker needs to do better on differentiating himself from the other two candidates. Too many people still either don’t know or have no opinion on Baker. This tour is an attempt to do that. Along with the speaking tour announcement, the Baker campaign released a new video that does a pretty good job of laying out that case. 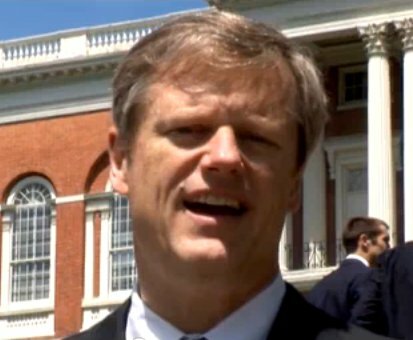 Baker speaks in front of the State House and points out that his two main opponents work inside. And then he reminds us that he used to work there – back in the Weld administration. It’s a powerful comparison – because Weld is well remembered, even among Democrats, as an extremely capable administrator. The tour schedule has a few interesting dates: Baker is going to speak in Cahill’s home town of Quincy, and his final tour appearance at the State House on May 20th coincides with the swearing in ceremony for Senators Ross and DiDomenico. While he’s speaking, he should speak to the RGA about removing the attack ads. It’s apparent to most voters that Baker signed off on this, and that’s why his numbers haven’t gone up. His “Had Enough” ad, is a lot more upbeat and positive, while still harpooning both major opponents. That’s the message he needs to stick with. Anything he says while the RGA ads continue seems two-faced. I completely agree with you. The RGA ads may have backfired a little. Everyone assumed that Cahill’s support was mostly among Baker voters – after all Cahill has be campaigning for the tea party vote. The RGA ads have hurt Cahill for sure – but surprise the support has been flowing to Patrick. Maybe Cahill is dividing Patrick’s support more than Baker’s. It’s clear Baker needs to do more to let people know how he is the solution than letting the focus stay on Patrick and Cahill as part of the problem. These ads and this tour will help him get that message out. The RGA’s attack ads and mailings are a complete turnoff. The minute I see one in my mail I trash it — I don’t even recycle it because the ads are like a poison that needs to be kept from the recycling stream. They are filled with lies, half-truths and naked innuendoes — besides being full of c**p.
As to Baker’s “new” slogan, I used that slogan on bumper stickers and my signs for the last two election cycles. I even had Tees made up with the slogan and they are all worthless to me now. The reason is that I do not want to be associated with the Baker campaign in any way, shape or form. If those ads continue and I continue to get that c**p in my mailbox and the ads have the effect of torpedoing Cahill’s campaign by their distortions and lies, not only will I vote for Patrick, I will put two of his signs on my lawn. It’s amazing that Patrick’s numbers are going up in relation to the ads — probably because he seems to have taken the high road. While Baker was making $millions as the CEO of a health-care provider — after Romney shoved that mandatory insurance c**p down everyone’s throats, the net result is that now that the health care providers have a captive audience, they are sticking it to the people with obscene rate hikes. Baker should be very proud of that — sticking it to the people who have no recourse. How is he any better than DeVoid DeVille — just because he’s taller? Way to go Charlie — I wouldn’t vote for you if you were the ONLY candidate. Why not take some time off to count your $millions?